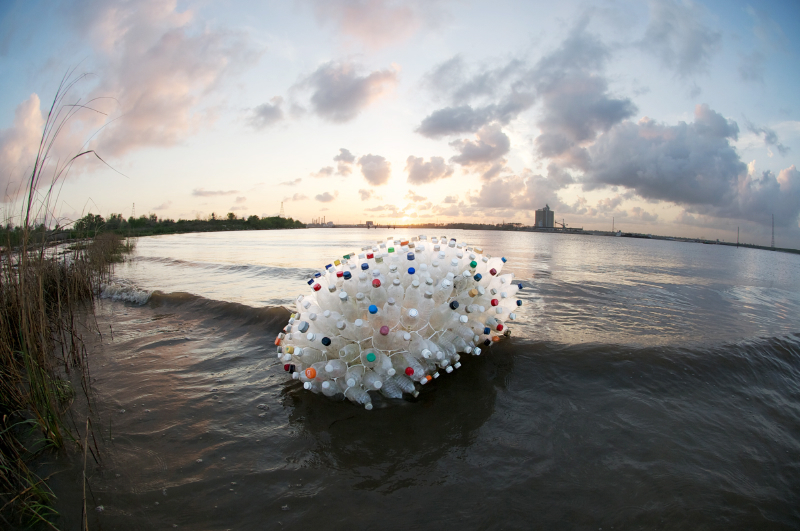 Sadly I have just been informed that the event below has been cancelled, however see the links below to find out about Wasteland the inspiring documentary by Vik Muniz and the Living Furniture Project in their new showroom/cafe in 22-26 Farringdon Lane. Please see our feed on the right hand column of the blog for more info on upcoming events. I will also be posting more on the London Design Festival for the next two weeks. 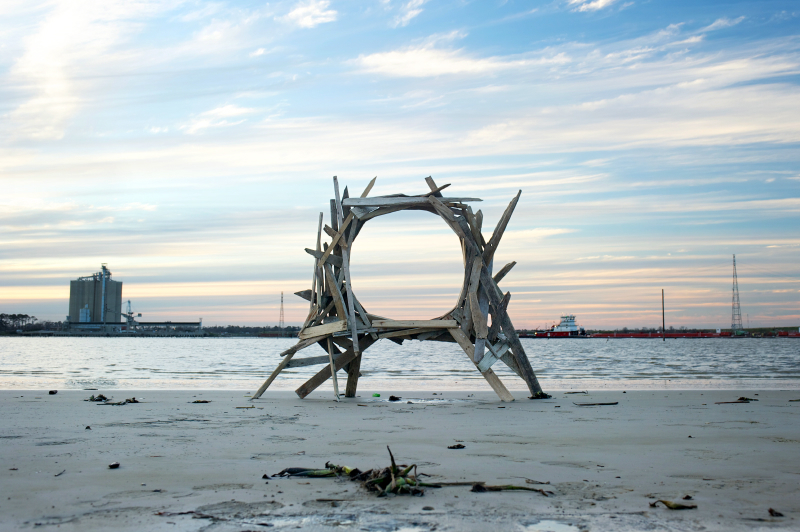 Next Monday, 16 September, there will be a screening of the award winning documentary Wasteland, as part of London Design Week. 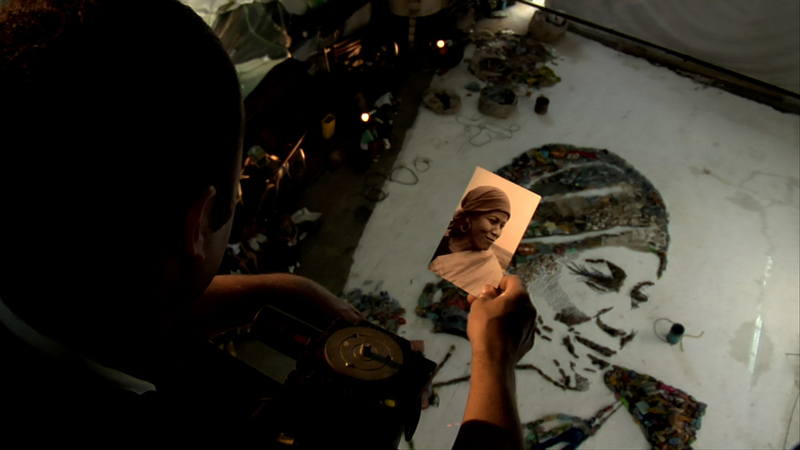 The film surrounds a landfill in Rio, Brazil and the lives of those that live and work on the site, while artist Vik Muniz creates art using discarded objects he finds among the rubbish. 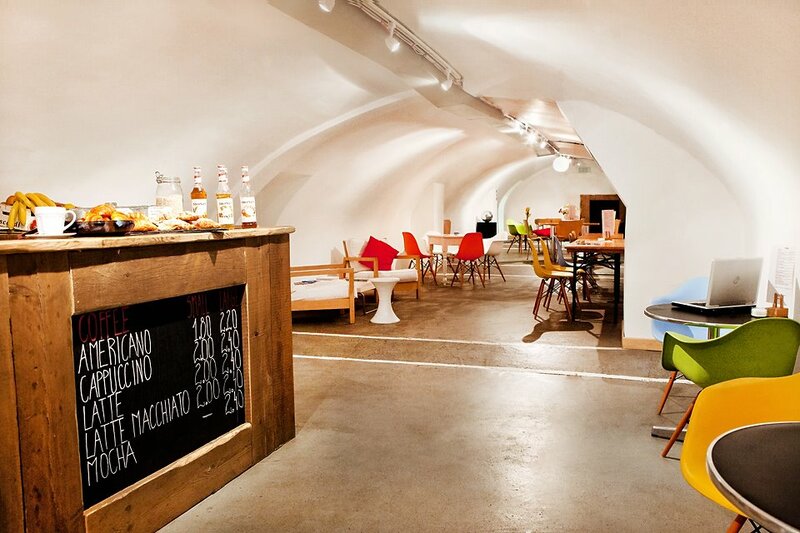 The event will be hosted by the Living Furniture Project at their fantastic new space in 22-26 Farringdon Lane in London and will feature talks and discussions as part of the evening. The speakers include representatives from Friends of the Earth, The Living Furniture Project’s very own Donna Walker, the renowned furniture designer Paul Kelley and product designer Erin Deighton. There will also be video art by Tom Sachs, which will be screened throughout. 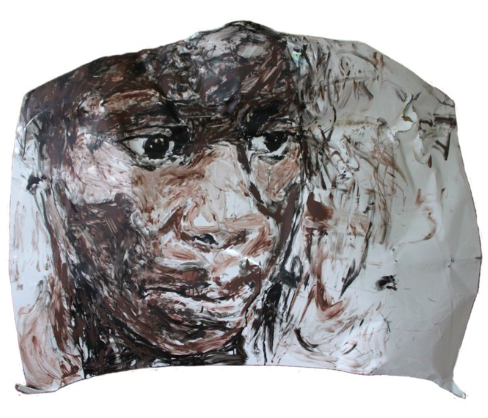 Michael Aaron Williams, a young American artist from Knoxville, Tennessee, has created art from discarded materials. 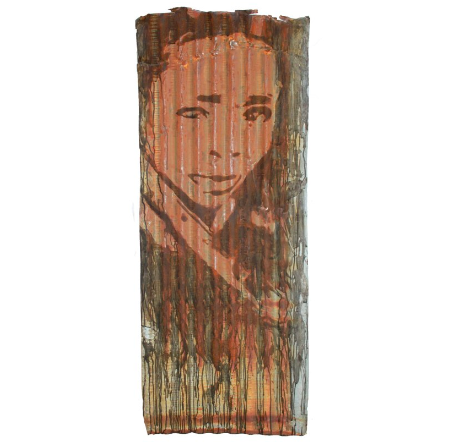 Found series 1 by Michael Aaron – on old railroad ties. 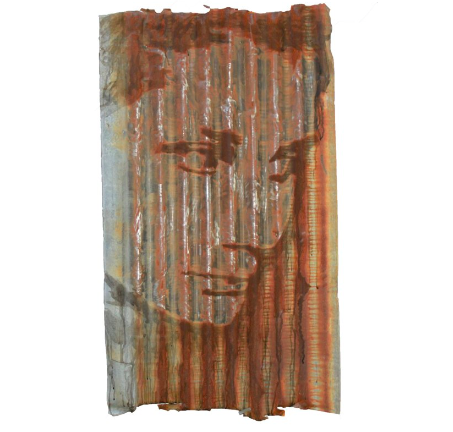 He uses the materials he has found as a canvas to create intense and almost disturbing portraits. 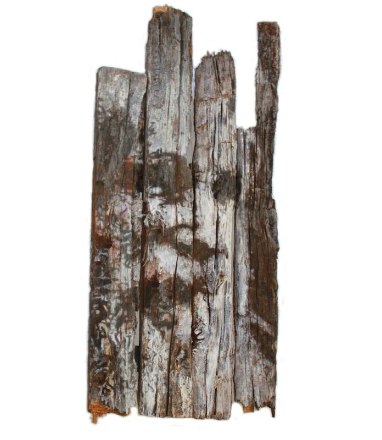 The organic and decomposing state of the pieces adds to the raw visual effect while also showing the beautiful transformation the artist has achieved. 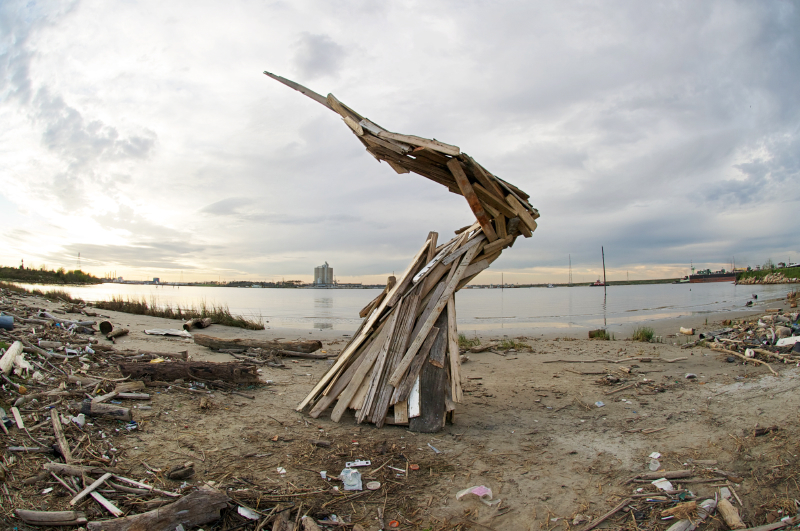 Michael Aaron seeks to save materials from their fate and repurpose them, making them into something that is valued and appreciated. He does not only experiment with different materials, but also different techniques in composing his work. 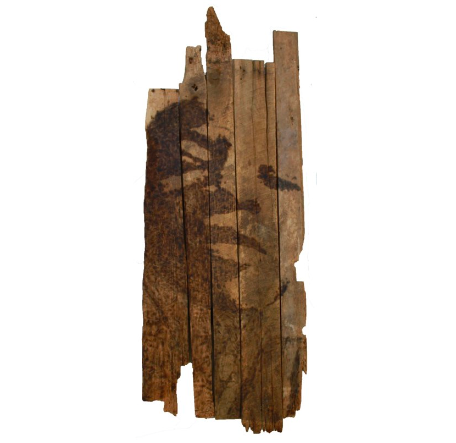 The piece below has been created using a process of burning the wood rather than painting it. Each portrait is simple yet captivating and very real, showing the artists ability to capture human emotion. Retrouvius have acquired some interesting salvaged metal structures. 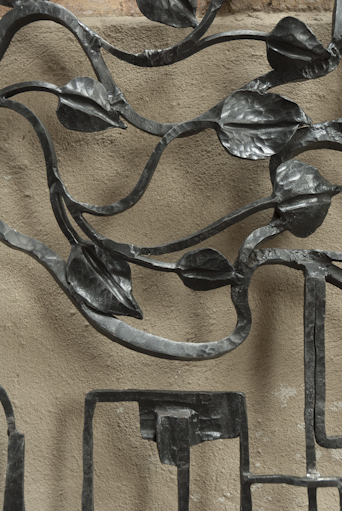 This decorative ironwork serves almost as a sculpture in itself. Against a wall the intricate details become more and more evident. 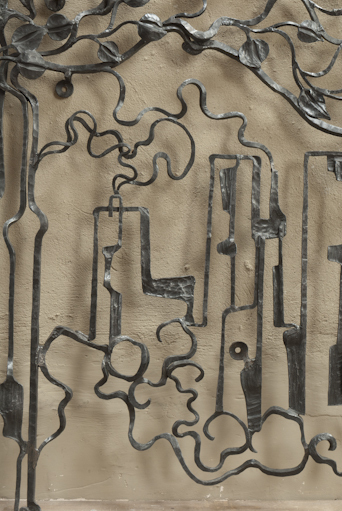 The complex handcrafted piece almost looks like an abstract drawing. 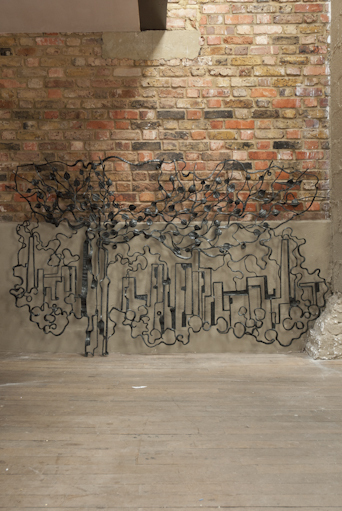 The squiggles gradually turn into carefully crafted leaves, moving away from their abstract beginnings. The straight metal lines incorporated into the centre of the structure resemble skyscrapers of an inner city. The swirling lines and round shapes then begin to make a little more sense the longer you look at the construction as a whole. 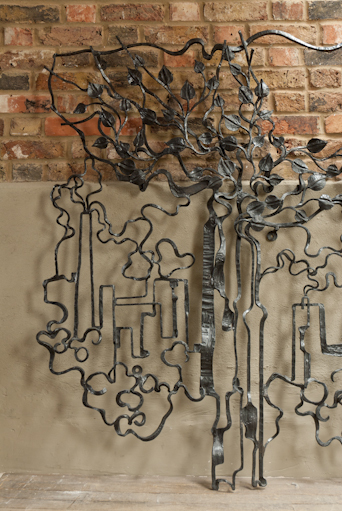 The curling lines make up the clouds of smoke and fumes surrounding the skyline and elegantly turn into leaves and shapes consistent with the wider picture. 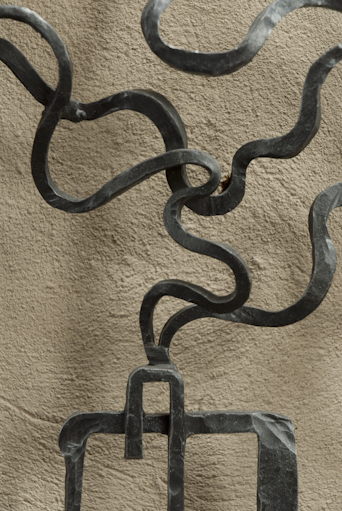 The ironwork is quite magnificent in its detail and craftsmanship, standing as a piece of art alone. 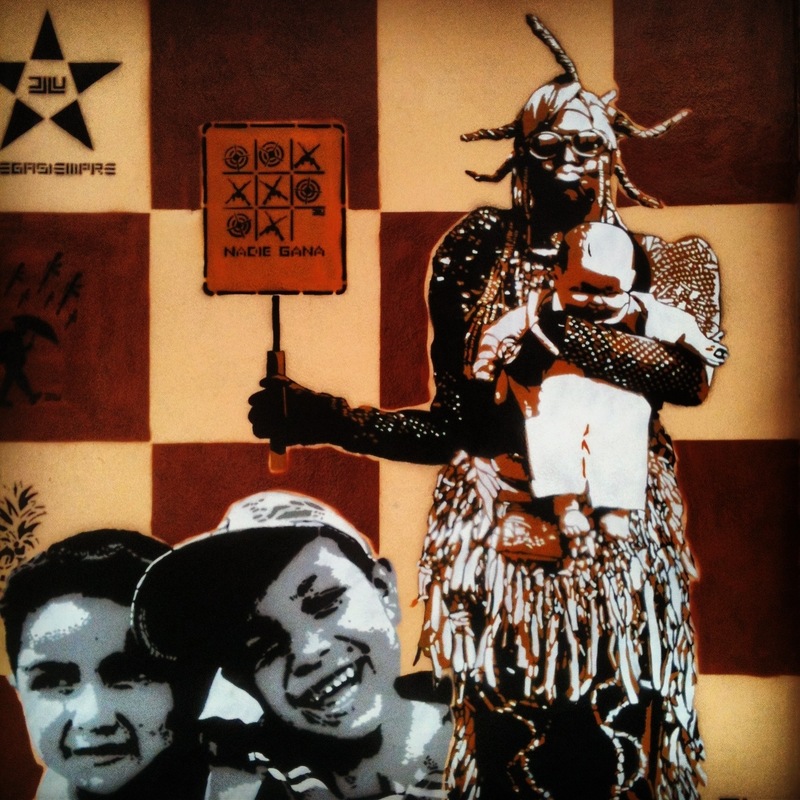 Street art outside a cafe in La Candelaria, Bogota’s old town, in Colombia. The woman is holding up a sign saying “nadie gana” (- nobody wins) below a game of noughts and crosses. 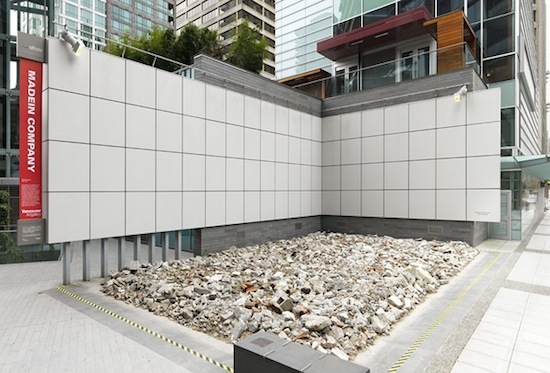 Chinese art collective Made In Company (Xu Zhen) have produced a rather unsightly yet inconspicuous art installation on display in Vancouver, Canada. Outside the downtown Shangri-La Hotel, lies a large rectangle of rubble. 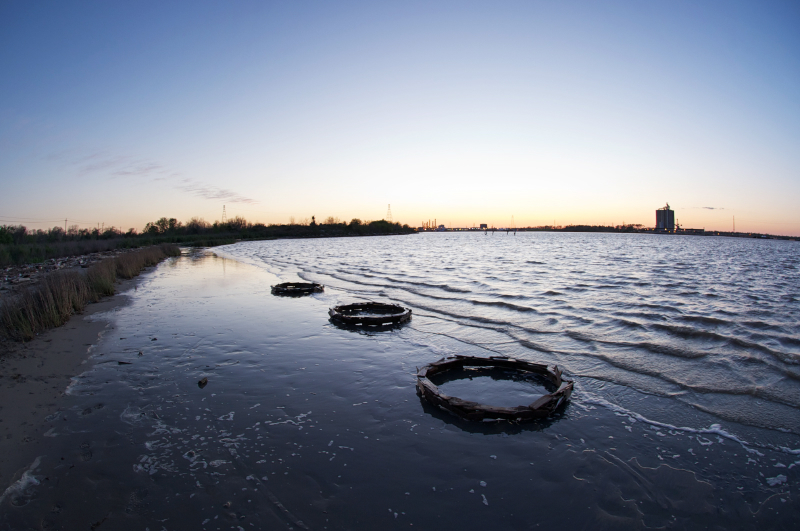 However these are no ordinary remnants from a demolition site. MadeIn Company, Calm, 2013. Mixed-media installation at Vancouver Art Gallery Offsite. Photo courtesy of Rachel Topham, Vancouver Art Gallery. When you step on the surface amid all the debris and broken bricks, the ground begins to wobble bouncing up and down like a giant water bed. The installation titled Calm signifies the the inert reaction that follows a violent event while also, rather playfully challenging the onlookers perception of reality. 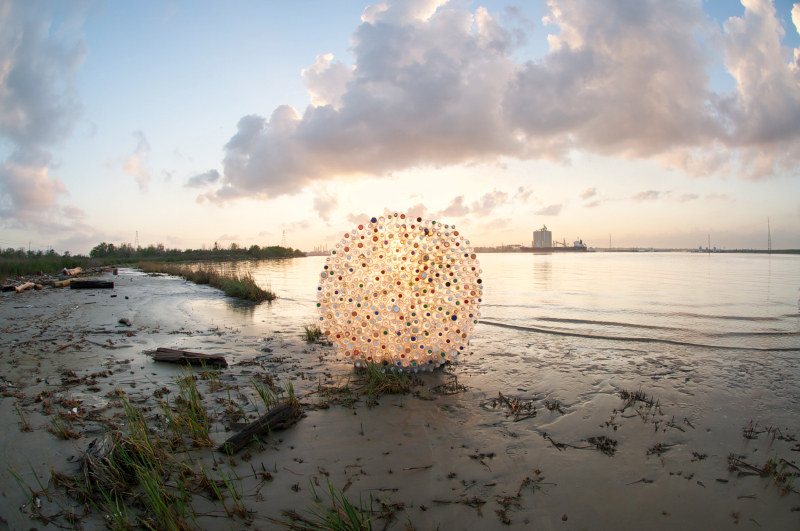 American artist Jeremy Underwood has transformed Houston’s waterways to showcase his sculptures made from discarded materials. 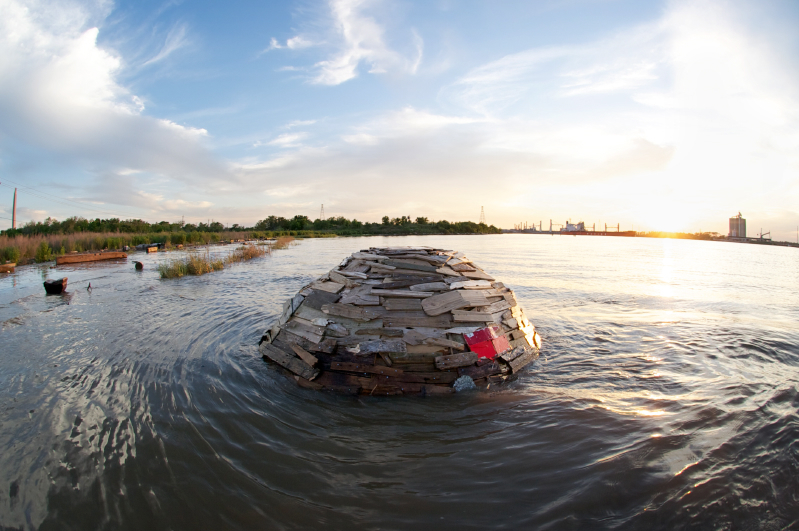 In his hometown of Houston, Underwood focused on reinventing these unwanted materials into something beautiful, while making a statement about the volume of waste channelled into these natural landscapes. 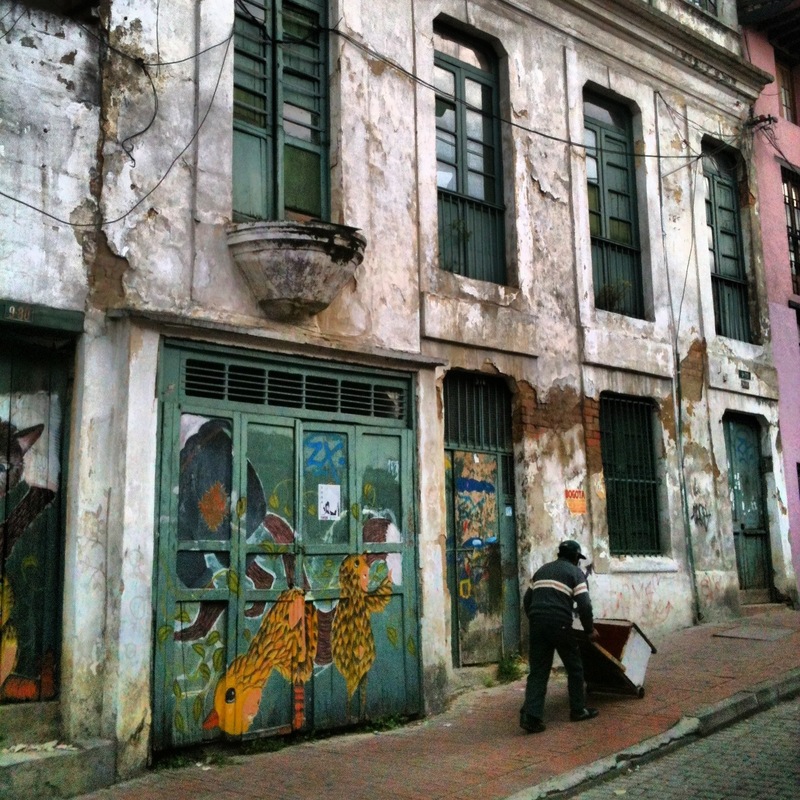 A man pushes a cart past a building decorated with murals in La Candelaria, Bogota – Colombia.